John Asher is the co-founder and CEO of D.C.-based Asher Strategies, a business providing sales advisory services to companies from start-ups to Fortune 500. John has been in sales for more than 40 years. In his Navy career, John managed a $2 billion submarine combat-systems program in the Pentagon. In his second career, he co-founded a Northern Virginia-based engineering company that grew by a compounded growth rate of 42% per year for 16 straight years. His current business has provided sales aptitude assessments, sales training, and sales process improvement workshops in 22 developed countries, and I’m also proud to say that John’s company is a platinum sponsor of the Institute for Excellence in Sales. He is also the author of the new best-seller Close Deals Faster, now available on Amazon. John has been recognized by Vistage International as one of titseir top sales speakers on the planet. Fred Diamond: I know you had a great career and trained tens of thousands of sales professionals. Let’s talk about your career, though, in sales. How’d you get into sales as a career? John Asher: As you know, I started my career in the Navy, and my last job was a program manager of a very large program. You’ve got three jobs in this role. First, you’re the program manager, managing the program. Second, you’re a buyer, and your staff puts out RFPs for local government contractors to bid on. And third, you are totally a salesperson. You’ve got to keep your program top of mind. You’ve got to respond to budget cuts. You’ve got to justify the ROI of your various components. My last job at the Navy was a total sales job. Fred Diamond: Tell us a little bit about Asher Strategies and what excites you about what you’re doing today. John Asher: Our main mode is to make the complex simple. The world is really getting more and more complex, especially with technology. Our whole deal is how can you help salespeople take all of that information out there and boil it down to what you really need to be successful in sales, and that typically includes having the right aptitude, having the right skills, and of course, having the right sales processes. Fred Diamond: What were some of the key lessons you learned from your first few sales jobs that have stuck with you today? John Asher: I learned early there’s a revolutionary new concept about sales, and that is listen to the customer. I know it sounds kind of funny, but you’d be shocked at how many people do not listen to the customer. It’s all about talk and not listen. Fred Diamond: People just kind of wait to talk, waiting for their turn, show up and throw up, without even truly understanding the needs of the customer. John Asher: Totally agree. The second thing I learned actually goes back to the Pentagon, and that is figure out when the buyer’s ready. I can’t tell you how many presentations I saw where there’s the admiral we’re presenting to, there’s a whole bunch of people in the room. It’s obvious to everybody but the presenter that the admiral’s ready to say yes, and as soon as he gives that hint, the presenter will say something like this: “No, no, no, no. I’ve got more stuff you need to see.” And so I learned way back when that you better know the six closing principles if you’re going to be a successful salesperson. Fred Diamond: Do you want to summarize the six closing principles in one minute or less? Number one, you can’t close till the buyer’s ready. Number two, if the buyer is ready and you don’t recognize it and you never propose a close, your chance of losing the sale is 90%. Number three, knowing when they’re ready is a combination of the dialogue and the body language, and the body language is the true signal. Number four, buyers want a definitive closing approach. They don’t want a two-paragraph close. Example, “Fred, would you like to get this project started on the 15th of June?” There’s no ambiguity there. It’s pretty obvious what I’m asking for. The fifth closing principle is once you propose the close, be silent. Let the buyer respond. The reason is buyers are thinking, considering, comparing, processing, and if you interrupt their thinking, they’re no longer thinking. And if you’ve interrupted their thinking it comes across as rude, and now the probability game is deal has gone down to 5%. And the sixth closing principle: Once the buyer has agreed, quit talking about the deal. Shift the discussion to sports or weather, because you could say something that will cause the buyer—and it’s happened to me—to think, “Whoa, I didn’t realize your simulation didn’t cover that,” and shift back to no. Fred Diamond: John, I know a lot of people consider you to be one of their mentors. Talk about an impactful sales mentor for you and how they impacted your career. John Asher: I’ve never had a specific mentor other than some very senior admirals when I was in the Navy, and then my main mentors in my civilian career have really been books. I know it sounds impossible, but I really have read about 300 sales books, and one of the reasons is I’ve been to China 106 times. I’ll read two sales books, one over, one coming back; after a while it adds up. There’s where my real mentorship has come from, just learning from the experts. 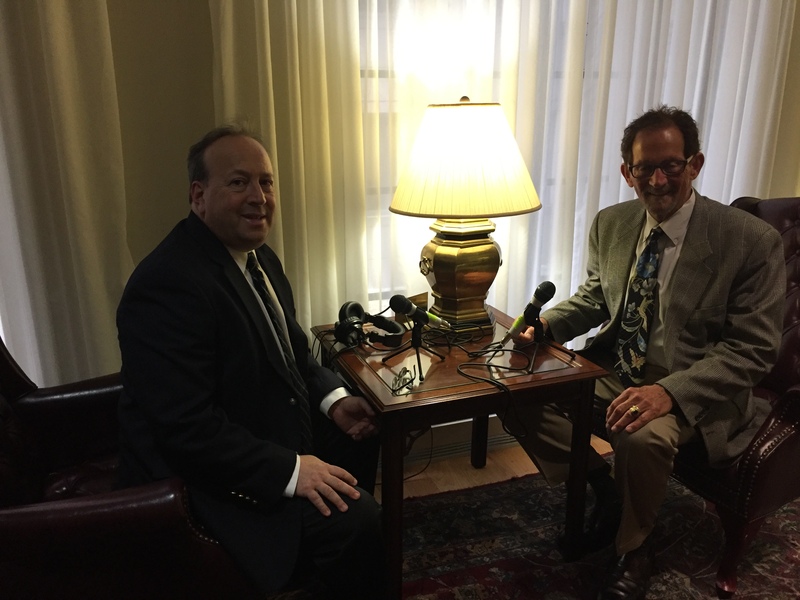 Fred Diamond: John, what is the number-one sales success or win from your career that you’re most proud of? Take us back to that moment. John Asher: Well, my second career, running an engineering company here in the D.C. area. On one day, we won three major government contracts for a total of $450 million, and that really caused the company to take off. It’s kind of amazing, three wins all together in one day. Fred Diamond: How much of the $450 million came to your firm? John Asher: Let’s see. I’m guessing for two all of it came, and for the third we had three or four subcontractors, so we probably got probably overall 80%. Fred Diamond: That’s not bad. John, you’ve had a great career in sales. Did you ever question being in sales? Was there ever a moment when you thought to yourself, “It’s just too hard or not for me”? John Asher: When you go back to aptitude assessments, you find people who’ve got a natural talent for sales, and I have a reasonably good talent. Then, for me it’s all about the thrill of the hunt and the close. I don’t care what I’m closing. I just want to close something. It’s not quite that bad but almost. Fred Diamond: Before we take a break, I’m going to go off script here a little bit. You mentioned assessments a couple of times and how that’s a critical part of your business. Would you mind just talking about the value of assessments at this point, and what are some of the things that you’re looking to assess when you try to determine if a sales professional will be successful? John Asher: There’s a whole bunch of them out there. We recommend one of the top three, and we represent it also, the APQ. It essentially shows you on a bell curve how much talent people have for sales. So, 20% of us are brilliantly suited, 60% are moderately suited, and 20% of us are not suited. Those 20% are like the engineers. So when we bring a customer to our company, everybody knows “Don’t let Bill talk to the customer.” We don’t want to hire knuckleheads from a sales standpoint. We want people who have high talent. And so, you peel back the onion a bit and say, “What does it mean to have a high talent?” If you look at nine personality traits, I’ll just give you a couple where it’s pretty apparent. You want people with a high goal orientation firing up the building. You want people with a high level of assertiveness so they don’t have any problem at all asking for the order at the right time. You want people with a high social drive so they actually like to go out and meet new people and build rapport. And you want people with a low detail orientation so they don’t get stuck in analysis paralysis. Those are four of the nine traits where you can pretty much tell who’s got the talent and who doesn’t. Fred Diamond: We’ll talk about that more later on, but we’re going to take a short break here, listen to one of our sponsors. John Asher of Asher Strategies has given us a lot of great information about his career, things that he’s thought about over time. When we come back after the word or two from our sponsor, John, I’m going to ask you for some of your tips for sales professionals who want to get ahead. John, what’s the most important thing you want to get across to the young sales professionals and anyone who’s listening on today’s podcast to help them improve their career in sales? One, they know how to build rapport and make an emotional connection with the buyer. Two, they really know how to listen to make sure they totally understand what the buyer needs. Three, they know how to come up with custom-crafted solutions to satisfy the buyer. Four, and most important, they understand the neuroscience behind sales, the six stimuli to wake up the old brain and the various cognitive biases that cause us to be able to build relationships faster and close deals faster with buyers. John Asher: If you want to go to the next level… you [need to understand] the neuroscience behind sales. In the past several years there has been an explosive growth of studies in neuroscience, how the brain works, and therefore how the buyer makes decisions. We know this now from studies at Harvard and other top universities where buyers are fitted with many MRI machines on their head. Various sales tactics are used by inside and outside salespeople so the researchers can actually see what part of the brain is awakened with what techniques and what part of the brain shuts down with what techniques. Sales has always been thought to be an art. We all learn by trial and error. We learn from our boss. We learn from experts. But now we know for sure, sales is a science. And now that we have the science behind us, it has actually upset a lot of what we used to think was the right thing to do. Now we know it’s not, and we know what is the right thing to do. Fred Diamond: That’s interesting because you and I have talked about The Challenger Sale many, many times. The customer is in control now. The customer has access to a lot more information, so you need to be providing value. You need to be helping them understand things that will help them in their business. I can understand how different parts of the brain now need to be enacted for you to be successful today versus where you could be successful 20 years ago. John Asher: I totally agree. Let’s discuss for a minute the six stimuli that will wake up the old brain. We now know from these various studies that all decisions are made by a combination of the emotional and the reptilian brain called the old brain, and the decisions are not made by the logical brain, the rational brain. Some of the listeners may have heard that we decide on emotion and justify with logic. We’ve all heard some version of that. That’s been around for a long time. Now we know for sure that’s how it works. So what this really means is if you are in competition with two other companies for the business, and all three companies have pretty good stuff, good quality, good service, reasonable prices, who gets the job? The one that makes the best emotional connection with the buyer gets the job, and if you want to wake up the buyer’s old brain there are six stimuli to work on. First, the old brain is “me, me, me” focused, so it’s got to be about the customer and not about the salesperson. Second, the old brain wants clear, simple-to-understand ideas. Make the complex simple. Keep it simple. Third, the old brain is all about the beginning and the end. It takes a lot of energy for the brain to make decisions, so it’ll hear what’s happening at the first, go to sleep, then wake up again at the end. Fourth, the brain wants a clear contrast. Fifth, the old brain only sees pictures. So your picture better be self-explanatory, because the old brain does not see facts, figures, or logic. Sixth, the old brain is all about excitement and engagement. Those are the six stimuli that we need to wake up in the buyer’s old brain, and if we don’t wake up any of those stimuli, closing rate is pretty much zero. Fred Diamond: If we go to the IESBD YouTube channel, John gave a tremendous presentation on this topic back in June at the IES seventh annual award event. So if you’re out there listening, you need to understand how the customer’s brain works, and you need to understand how you trigger the right things based on how the brain works to help your sales happen. John, what are some of the things that you do to sharpen your saw and stay fresh? John Asher: I really do read a sales book a week, subscribe to various sales manuals, and research on the internet because in today’s world, innovation is really everything. And as Fred mentioned, with all the information out there available to everybody it’s very easy to have one of your competitors go challenge the buyer, as in The Challenger Sale, and upset you. You really need to stay ahead of the competition, and for us who do sales training, aptitude assessment, sales process help we have to stay ahead of the pack. Fred Diamond: John, what’s a major initiative you’re working on today to ensure your continued success? John Asher: That is really this continuous learning, and so for our company, our main mode is keep the complex simple for salespeople to get what they need to do and [engage in] continuous learning. Making the complex simple sounds simple, but it’s actually not. Some of you may have heard a famous speechwriter from a long time ago. I won’t mention his name, but he basically said, “It took me a week to develop a 10-minute speech.” It takes a lot of hard work to boil down a complex technology, integration of technologies, and get it so salespeople can easily use it and be successful. Fred Diamond: John, sales is hard. People don’t return your calls. They delete your emails. Why have you continued? What is it about sales as a career that keeps you going? John Asher: As I said before, Fred, it’s the thrill of the hunt and the close. I really don’t care what I’m closing. I just want to close something. It’s not quite that bad but almost. And so, when you have people who have that attitude and have that aptitude and their personality fits for sales, then life’s pretty damn good. If sales is a struggle, then life is pretty tough. Fred Diamond: John, you’ve given us some tremendous information, and we could probably talk for hours about things that you’ve discovered. I know you’re a student of sales. Give us one final thought. You talked before about making the complex simple, continuous learning, how the brain interacts and how as a sales professional you need to know about it, but give us one final thought to share to inspire our listeners today. John Asher: I’ve read 500 business books over many, many years, and there’s one book I recommend above all business books. It’s a short read. It’s a story. It’s called The Go-Giver, and the subtitle is The Five Laws of Stratospheric Success. It applies to all fields really but especially to sales. It’s a two-hour read. It’s a fun read, and it changed my life when I read it 10 years ago. Fred Diamond: John, before we wrap, you also have a book that’s coming out in the very near future. Tell us a little bit about your book. John Asher: It essentially takes everything we’ve learned over 40 years of sales and puts it in one book. 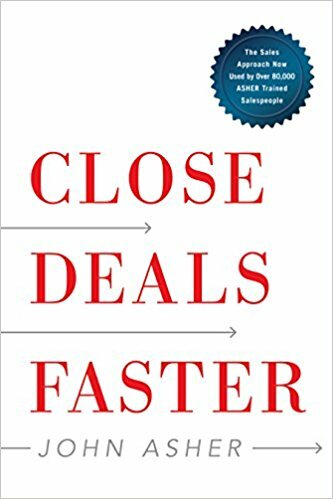 The title of the book is Close Deals Faster. It takes essentially most of the stuff I’ve been talking about. That is “How can you use all our new knowledge of how the brain makes decisions to close deals faster?”That’s the bottom line for almost all of us. Fred Diamond: John, tell our audience how they can reach you. John Asher: You could come to the website. It’s www.asherstrategies.com, and of course, we’re on Facebook, Twitter, LinkedIn, etc. We have on our website a new Vimeo portal where all of the various, probably 70, videos are, including the one that you mentioned.